This time, I have gathered together developers who worked on Wii Play: Motion. We had a number of developers compete in making minigames specially designed to utilise the features of the Wii Remote Plus controller and gathered them together into one game. I think it was the first time that Nintendo has ever made a game in that fashion. I doubt many games are made like that, so I wanted to make use of this occasion to have developers from the various companies who participated in development meet all at once. I wanted to ask them about what development was like, and we ended up with eleven people! First, would you each please introduce yourself? I was project producer for this game. 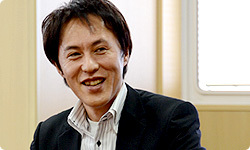 I’m Toyokazu Nonaka in Nintendo’s Software Planning & Development Department. I’m Etsunobu Ebisu from Good-Feel.1 We made the minigames Skip Skimmer and Veggie Guardin’. Good-Feel mostly makes action games. Previous Nintendo games that we have worked on include Wario Land: Shake It!2, Kirby’s Epic Yarn3, and ‘Tales in a Box: Hidden shapes in perspective!’.4 1.Good-Feel Co., Ltd.: A video game company based in Kobe, Hyogo. 2.Wario Land: The Shake Dimension: An action game released for the Wii console in July 2008 in Japan and in September 2008 in Europe. 3.Kirby’s Epic Yarn: An action game released for the Wii console in October 2010 in Japan and in February 2011 in Europe. 4.Tales in a Box: Hidden shapes in perspective! : A puzzle-adventure game made available for download as Nintendo DSiWare software in March 2010 in Japan and in June 2010 in Europe. 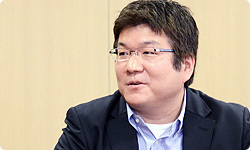 I’m Yuichi Mizobe from Chunsoft.5 We made the minigames Star Shuttle and Dolphin Park. In the past, we worked on You, Me & The Cubes6 for Nintendo. I think it was fate that Nonaka-san approached us about this project. 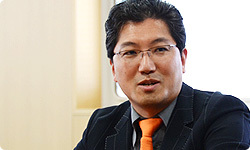 (laughs) 5.CHUNSOFT Co., Ltd.: A video game developer based in Shinjuku Ward, Tokyo. 6.You, Me & The Cubes: A 3D action game made available for download as WiiWare software in March 2009 in Japan and in September 2009 in Europe. Developed by From Yellow To Orange, Inc. (fyto, Inc.). I’m Hirosato Funaki from Mitchell.7 We made the minigames Treasure Twirl and Loony Cycle. We’ve worked on such Nintendo software as Polarium8, Actionloop9 and Sujin Taisen: Number Battles.10 We’ve made a lot of logic games, so this was our first action game. 7. MITCHELL CORPORATION: A video game developer based in Suginami Ward, Tokyo. 8. Polarium: A puzzle game released for the Nintendo DS system in December 2004 in Japan and in March 2005 in Europe. 9. Actionloop: An action-puzzle game released for the Nintendo DS system in March 2006 in Japan and in January 2007 in Europe. 10. Sujin Taisen: Number Battles: A strategy-puzzle game released for the Nintendo DS system in June 2007 in Japan. A version of it was made available for download as Nintendo DSiWare software in Europe in August 2009. 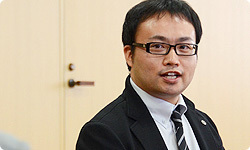 I’m Ryusuke Niitani from Nintendo’s Software Planning & Development Department. I provided overall technical support, while also planning and programming the minigame Teeter Targets. 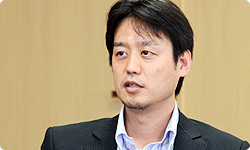 Niitani-san belongs to our department that provides technical support to external developers. Usually, he helps out the development staff, so this was his first time to make software himself. Yes. I wanted to make a game myself if I ever had the chance, so I gave this my best shot. I reworked Paper Plane and Pyoro11 as Nintendo DSiWare software, but this was my first original game. 11. Paper Plane and Pyoro: Action games made available for download as Nintendo DSiWare software in December 2008 in Japan and in April 2009 in Europe. They are reworked versions of games included in WarioWare, Inc.: Minigame Mania for the Game Boy Advance system. 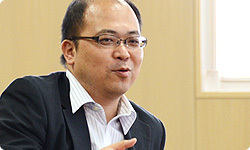 In the beginning, we were talking about how we might need to ask someone else because it would be hard to do both game development and technical support, but Niitani-san said, “I wanna do it!” So during the daytime on weekdays he provided technical support and he spent his other time developing a minigame. 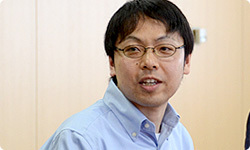 I’m Takehiko Hosokawa from the Software Planning & Development Department at Nintendo. I provided overall direction. I was also in charge of stage structuring for Niitani-san’s Teeter Targets. You were working on METROID: Other M12 until recently, and as soon as that was over, you jumped into this. 12. METROID: Other M: An action game released for the Wii console in September 2010 both in Europe and Japan. Yes. When I joined partway through, everyone’s prototypes were done, so we started choosing which games to include in the final package. I’m Keita Eto from Skip.13 We worked on the minigames Pose Mii Plus and Flutter Fly. For Nintendo, we’ve worked on such games as the Bit Generations series14, the Art Style series15, the Chibi-Robo! series16, and, more recently, Snowpack Park.17 13. SKIP Ltd.: A video game developer based in Shibuya Ward, Tokyo. 14. Bit Generations series: A series of seven games released for the Game Boy Advance system in July 2006 in Japan: Dotstream, Boundish, Dialhex, Coloris, Orbital, Digidrive and Soundvoyager. 15. Art Style series: A series of twelve games released as Nintendo DSiWare and WiiWare software. The Nintendo DSiWare titles are INTERSECT, BOXLIFE, KUBOS, PiCOPiCT, NEMREM, CODE and AQUITE, and the WiiWare titles are ORBIENT, CUBELLO, ROTOHEX, light trax and PENTA TENTACLES. 16. Chibi-Robo! series: A series of “chibi action-adventure” games released for the Nintendo GameCube system, Nintendo DS system and Wii console in Japan. In Europe, Chibi-Robo! for the Nintendo GameCube system was released in May 2006. 17. Snowpack Park: A penguin simulation adventure game made available for download as WiiWare software in December 2010 in Japan. I’m Jun Taniguchi from Vanpool.18 We were in charge of the minigame Wind Runner. We’ve worked on such games as Freshly-Picked: Tingle's Rosy Rupeeland19 and Irozuki Tingle no Koi no Balloon Trip20 for Nintendo. We’re particularly good at niche games, but this time we worked hard to reach a wider audience. 18. Vanpool, Inc.: A video game developer based in Shibuya Ward, Tokyo. 19. Freshly-Picked: Tingle's Rosy Rupeeland: An RPG released for the Nintendo DS system in September 2006 in Japan and in September 2007 in Europe. 20. Irozuki Tingle no Koi no Balloon Trip: An adventure game released for the Nintendo DS system in August 2009, only in Japan. I’m Yuji Naka from Prope.21 We were in charge of the minigame Trigger Twist. We actually had proposed something different, but we lost in competition only to crawl our way back up in the consolation round and make this minigame, so I couldn’t be happier. 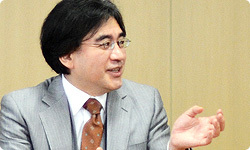 This was our first time to work with Nintendo, so I’m glad to have formed this relationship. 21. PROPE Corporation: A video game developer based in Minato Ward, Tokyo. I’m Naoto Ohshima from Arzest.22 Our company was founded about the time this project took off. We were in charge of the minigames Jump Park, Cone Zone and Spooky Search. Naka-san just talked about the consolation round, but our Spooky Search and their idea were alike, so we were lucky to get ours approved. When I heard that later, I was like “Wow!” (laughs) I was surprised that we would think of the same kind of game. 22. ARZEST Corporation: A video game developer based in Yokohama, Kanagawa. You and Naka-san worked together on Sonic the Hedgehog23, so you share roots when it comes to coming up with ideas. 23. Sonic the Hedgehog: The first game in the Sonic series released in July 1991 in Japan and in Europe in June 1991. 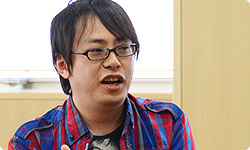 Mr. Naoto Ohshima designed the characters and Mr. Yuji Naka programmed it. 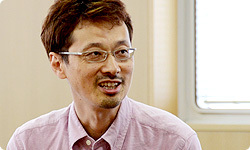 I’m Shinya Takahashi from Nintendo’s Software Planning & Development Department. As general producer, I was the head organiser. I was this project’s ringleader, but it kicked off when people in sales in Japan and overseas said, “We want you to make a Wii Remote Plus version of Wii Play24 and I started thinking about how I could make such a thing. 24. Wii Play: A game that serves as an introduction to handling the Wii Remote controller. Released for the Wii console in December 2006 both in Europe and Japan as a set with the Wii Remote. It’s extremely rare for Nintendo to make a game based on a request from the sales and marketing team. It’s basically development’s job to make proposals to them before receiving ones from them. That’s right. My department’s strong point is its ties with lots of companies, so I began by thinking that we might be able to draw upon the characteristics of each one by having lots of companies make the minigames. We had all kinds of trouble once we got started, but all these companies cooperated and completed the product. We were able to do that because everyone involved drew upon their strengths in their individual fields. I think that is really quite something! You proved that you can make a high-quality game through competition. When this project began, how did you become involved, Nonaka-san? Well...Takahashi-san suddenly called me and asked me to do it. It didn’t seem real at first, and I thought, “That sounds tough,” as if it didn’t pertain to me. (laughs) It was a new way to make games, and it was an awfully short period of time to coordinate so many companies, so I was concerned. But my group is used to working simultaneously on several titles, so I came to feel that we could manage somehow if we drew on our existing know-how. First, I explained it to the group managers of Nintendo’s Software Planning & Development Department and began contacting each of the companies we work with. I came in just when prototypes had begun. The challenge put forth by Takahashi-san was to draw out the character of each company, so I started by giving them presentations about the challenge.